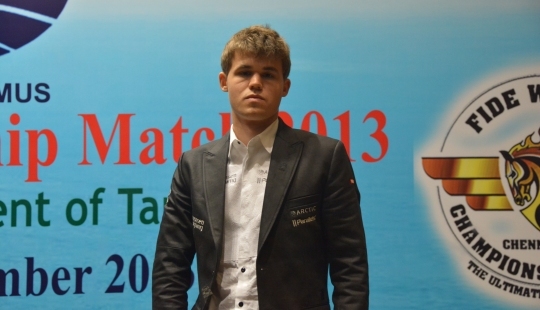 World Champion Magnus Carlsen will visit Moscow Institute of Physics and Technology on 8th April. The official part of the visit will take place on April 8 at the MIPT Concert Hall, where Magnus Carlsen will meet with MIPT students and guests. The event starts at 10:30 am. The meeting host will be Tina Kandelaki, and the meeting will be held in English. “He beats leading chess players in such positions in which people usually settle for a draw. He has an absolutely phenomenal technique and calculates variations very well, as young people do,” MIPT quotes GM Evgeny Bareev. The main purpose of the event, organized by Runa Capital fund, Phystech-Union and Sberbank Technologies, is to give an opportunity to talented students to meet the World Chess Champion and to mark a new stage in the development of an IT cluster at MIPT.